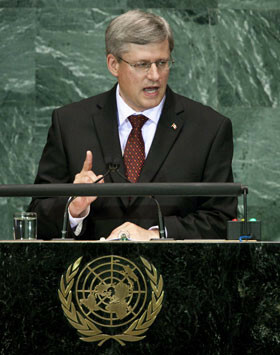 Last week, the international community said no to the Harper Conservatives’ bid for a UN Security Council seat. This loss confirms one thing: that Canada is no longer an “honest broker” welcomed by the world, but a country in isolation. Despite Conservative attempts to obfuscate the issue and lay blame elsewhere, political scientists and commentators are unanimous—Harper’s foreign policy is to blame for the loss. The current government’s carte blanche for Israel and disregard for Palestinian rights has been noted both domestically and overseas. Also, Canada’s funding cuts to Africa does nothing to uplift a historically victimized continent. If there were ever a sign, the UN Security Council loss is it. Now is time for citizens to act. We have to work and reclaim Canadian foreign policy and our country’s reputation.